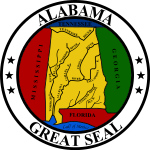 The 1908 United States presidential election in Alabama took place on November 3, 1908. All contemporary 46 states were part of the 1908 United States presidential election. Alabama voters chose eleven electors to the Electoral College, which selected the president and vice president. Alabama was won by the Democratic nominees, former Representative William Jennings Bryan of Nebraska and his running mate John W. Kern of Indiana. This page was last edited on 14 December 2018, at 17:08 (UTC).